I tend not to be a person that customizes their interface much. 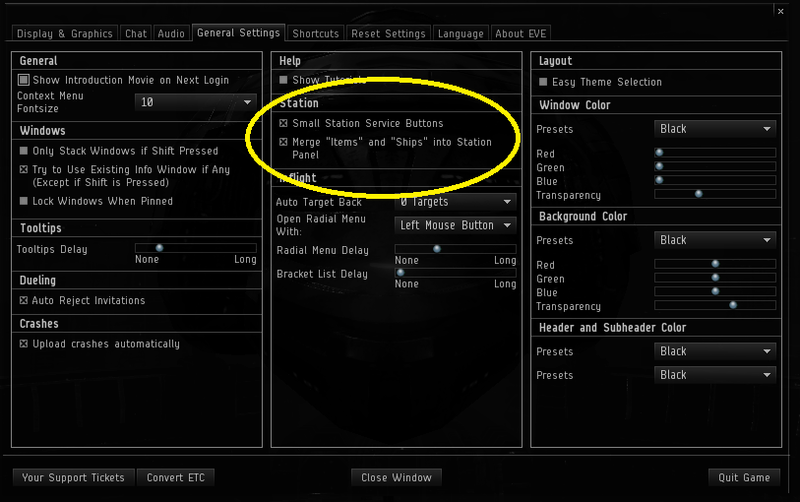 When I started playing Eve I looked around at the various options and I found one very early on. Combine ships and items into station services. I have absolutely no idea why this is not an automatic setting. It keeps your ships and your items right at hand. I think it would have solved a lot of the rage when the unified inventory was first introduced simply because people 'lost' their stuff. I've showed this to a few people off and on. I just showed it to a vet who was ranting about the UI and he was like, "Oh. This is better." Note: The Cynabal does not come with the setting. I remember a stat that only 12% of people use it. I may be absolutely wrong. However, it stayed with me because it seemed like a very small number to use something that was very useful in my opinion. And, isn't that what opinions are for? To try to force everyone to use things exactly as you do? This makes perfect sense to me. I think it should be a default setting. I also think that it would be more intuitive to new players who need to access their 'inventory'. Or, maybe I'm just weird and the only person that likes this. But, that's okay. Everyone should like it. Everyone. oh, interesting. didn't know about that. It's usefulness for me will depend on how good the filter is though.. It won't show up from the character selection screen. You need to be logged in with a specific character and hit esc before it will. Just an FYI. Sure it will (or it should). I've been using this for years and as long as I'm docked at log-off, the tabs automatically show up on log-in. Perhaps once you've done it for the first time and is then active. But for someone who has never had it on before it doesn't. Last week I lost all of my user settings for the first time in four years, had to start from scratch with overview and all the custom settings. When I logged back in I literally couldn't find my ships! 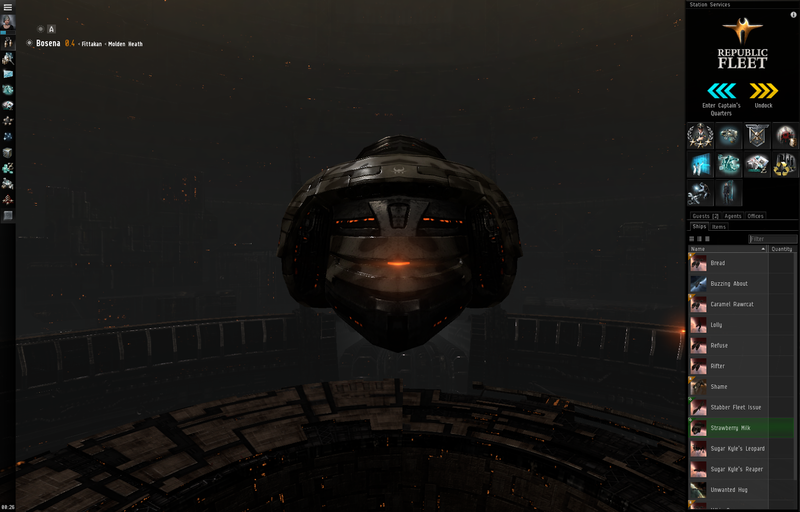 I've had the "combine" option selected for as long as I've been playing Eve - was weird not seeing it. Every time I have a reset or a new account I'm confused. Is it hard to look at this fresh, faced youthful blue hair from your front porch shaking your cane while I dance on your lawn? Feh! You think you know dancing? Why back in my day, now we, we, knew dancing. Uh, sorry but I REJECT YOUR REALITY AND SUBSTITUTE MY PWN! I minimize my chatscreen layout and other informational windows for screen shots. I also only open people and places if I need to make a bookmark in warp. Holy crap where has that setting been my whole Eve career. Can't wait to get home tonight and set it. Been in the game since beta, at one point that was the only way to view your inventory. They took it away briefly when they did the UI but after many complaints brought it back. You can stretch the station services panel if you want it wider. On any new install (or settings clearing), this is the first thing I change in my settings, before even importing my Overview.